Twenty-three years ago, the continent of Europe was desolated by the worst nuclear disaster the world had ever seen. It wasn’t until amazingly four months later, the future manager of the national team Andriy Shevchenko, was eventually evacuated along with his classmates. At that point, the Soviet State of Ukraine still existed, along with its strong communist hatred of the West. Even a planet changing catastrophe was still somehow covered up to hide its national embarrassment. With the aftermath, Ukraine had very little to show in any sense, once the fall of the wall in 1991 had happened. Only small glimpses of hidden locked up footballing talent were portrayed during the 70s and early 80s, by the countries dominating team of the era Dynamo Kiev. Those teams were fundamentally produced by the mythical forward-thinking pioneer Valeriy Lobanovskyi. A man who orchestrated the early beginnings of Ukrainian football, a player himself who was renowned for his corner scoring abilities. But as manager of the Kiev team that swept through the red army clubs in the Soviet era, then onto winning numerous consecutive domestic titles of the newly formed Ukrainian Premier League. During his third stint at the club, it was then that the young brilliance of the already mentioned Shevchenko was unleashed to the rest of Europe. Lobanovskyi once said that the young Ukrainian at the time was ‘the white Ronaldo’. At a time that O Fenômeno seemed untouchable, it was perhaps because the world hadn’t seen enough of Kiev’s number 10 yet. For the player who lead, as captain of the National team out to battle in Germany in the 2006 World Cup finals. However, Shevchenko’s Golden Boot and goalscoring abilities well and truly began in Ukraine’s most populated city. After failing to follow in his father’s military footsteps, nevertheless, the fruitful goal scorer was already on the path to his first professional contract. An early acknowledgement came after his under 14 Dynamo side won the Ian Rush Cup in 1990 held in Wales. Shevchenko was given a signed pair of boots, from Rush himself after finishing top scorer of the tournament. Of course, it seemed that his natural devastating true ability wasn’t going to be lost. Taking his first stride into the first team aged 18. But it wasn’t until Lobanovskyi, who came back from his middle-eastern national team period in 1997, that the striker’s brilliance was unlocked and shown. Paired with a signing from arch-rivals Shakhtar Donetsk, Serhiy Rebrov, who also was capable of leading the continuous pressing game the dominant enigmatic coach wanted. In ways just like how the Red Army battled through Berlin, Lobanovskyi still coherently wanted essences of true eastern grit to be shown in Kiev’s attacks. What was demanded of Sheva, was that he had to be the complete universal player on the pitch for Lobanovskyi’s team to operate. Subsequently not the typical goalscoring poacher, which was still a common notable trait back in the late 90s. Fast forward today, and you have the more complete Robert Lewandowski and Harry Kane. They will top the scoring charts but also show and signify how the evolution of the modern day forward has happened. Both now are fully competent in being able to find the killer pass and make the players around them find the scoring positions. Lobanovskyi inherited a sharp, eager to learn and goal-hungry forward in Shevchenko, but he was able to mould him into a more dynamic all-round game changer. Who was able to adapt to the excessive pressing game, that his manager wanted straight from the start of his final tenure at Kiev. However like with every soldier, necessary physical and mental training was required to pull through the ranks. Shevchenko had his early rough edges at the beginning, famously being a regular smoker as most young Ukrainians had adopted the habit throughout the Soviet era. Sheva was requested to stop smoking immediately by his manager, who supposedly gave a nicotine powdered drink that made his star forward empty his insides every time he smelt a cigarette. This youthful but well organised Kiev side with its fierce attitude began to blossom as it came into the 1997 Champions League campaign. Especially Shevchenko who shone throughout the group of death, that favoured Louis Van Gaal’s Barcelona and Premier League challengers Newcastle to progress. Apart from their only loss at St James Park, Kiev fired havoc across the defences accumulating 13 goals in the group stage. Most in the memory for the Kiev fans would be both encounters with the Catalan giant. A club that had an enrichment of South American and Portuguese talent, now thanks to the ever-present Bosman ruling. It was Kiev who embarrassed in the first match, swiping away their opponents easily in a 3-0 home win. Then came the return match at the intimidating colossal structure known as Camp Nou. Even those who had been in Kiev during the first dissection of Barcelona believed that perhaps it was just an off night for Van Gaal. Who after that loss began to lose his authority with his own team. 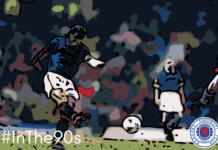 Up stepped Shevchenko, who became Barcelona’s worst nightmare on the night. Scoring the first hat-trick by a Ukrainian player in the Champions league, within the first 45 minutes of the away game. What seemed exquisite about the performance in general, was the striker’s ability to glide swan-like through experienced European defenders such as Albert Ferrer and Fernando Couto. Punters across Europe who were in the know managed to come out as winners thanks to checking out websites like this and clever bets based on Sheva being placed. His goals came from two headers and a self-won penalty kick, which he converted clinically. This was the night that the giants of the European game took note that perhaps a scout or two could be given the cold duty of scowling the old eastern block. Shevchenko had just put Barcelona to sleep and proved that Kiev were here to challenge. Domestic Glory was won that season but European respect was gained more crucially. It was the Old lady of Italy who scraped past Lobanovskyi’s machine in the first knockout round. Juventus who themselves got to the final, only to be defeated against the King’s club Real Madrid. With maturity and a well-oiled collective of plays in the tactics book for Kiev to build upon, the following season propelled them to new heights that have been unparalleled sadly ever since. Again even with the uprising of rivals Donetsk starting to battle and gain further position strength in the Ukrainian league. Dynamo with its 18-goal striker clinched yet another title. Lobanovkyi was certain that they had the firepower and now the pedigree plus experience to power through their Champions League group without much trouble. A slight sense of complacency was at first shown in the opening matches of the group stage, but it would take a late equaliser from Rebrov to settle a point against Arsenal at the old Wembley stadium. Now both strike partners were anticipating stranger shores in the more luxurious leagues of western Europe. 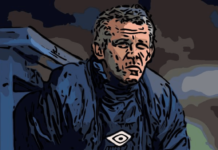 Kiev knew after reaching yet another Champions League last eight, it was destined to be the last for a team containing both Shevchenko and his partner in crime Rebrov. Playing against the defending champions was probably to this day the pinnacle moment of the late 90s Kiev side. This was no standoff and let the reigning European holders steam roll and move on job though. Of course, unlike last season where Kiev was most likely completely overlooked by Spanish opponents, Real knew they had their hands full. That was still not enough to stop the ever-present number ten of Kiev to latch onto a header and poke past Madrid’s keeper Bodo Illgner, snatching an away goal for the travelling team. Even the late equaliser for Madrid still wasn’t enough for Kiev to return back home and stop Shevchenko yet again creating more of a reputation. Two goals came for the inform Ukrainian, to send Kiev through to their first Champions League semi-final under Lobanovskyi. The fairytale didn’t end with the cup in the Dynamo cabinet. A powerful but disappointing second-half collapse from Kiev left the door open for Bayern Munich, who had the secured the vital away goals. His fourth and fifth goals came in the knockout stages, but even the fresh-faced striker this time around couldn’t rescue his side. Perhaps a chance that Dynamo Kiev will never get again. Maybe Ukrainian football will never again see a team in the last four of the greatest club competition in the World. A fee of around 25 million Euros, took Shevchenko to the Western World. 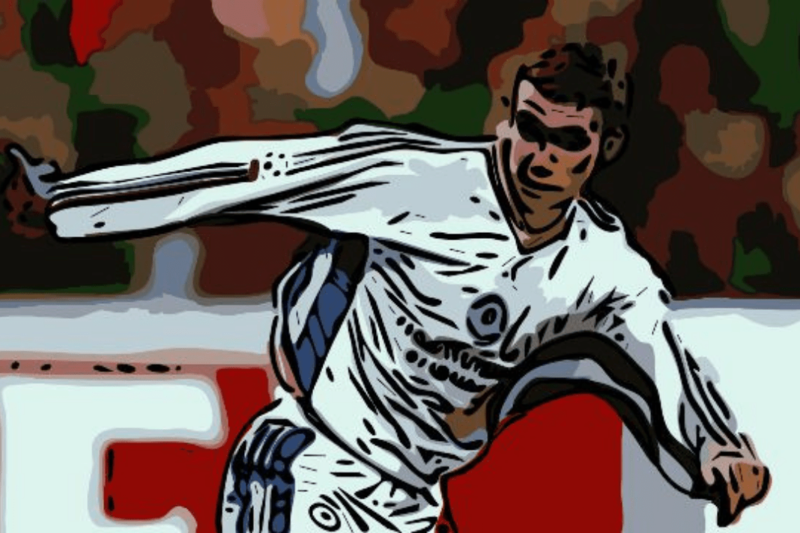 But after maturing and scoring 60 goals, propelling Kiev onto the known stage, Shevchenko had managed to link the unknown Eastern Football with the other half of Europe. Off to Milan where he won finally what slipped away from his grasp in the semi-final loss to the Germans in that ever remembered 99′ encounter. A lasting memory of a Champions League winners medal which in a show of great humility and respect was left on the grave of the man who made all of this possible for Shevchenko, Valeriy Lobanovskyi.